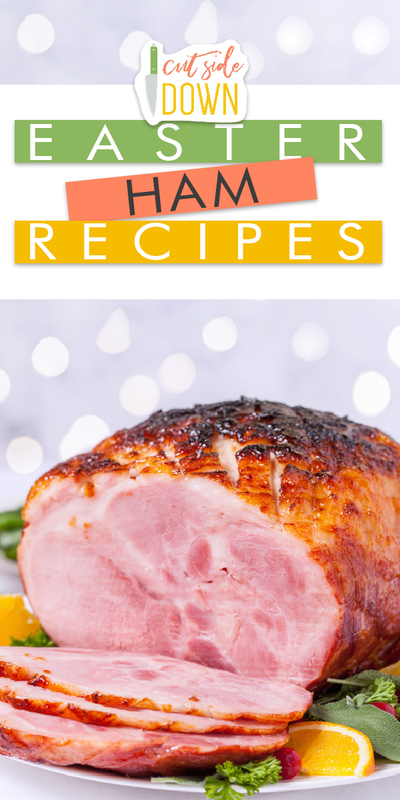 If you’re looking for a new way to present your Easter Ham, or perhaps just looking to refresh an old recipe, I’ve got the basics you need for a fabulous Easter Ham. It’s a good idea to have a beautiful serving platter to really showcase that ham. This platter will do just that! Its soft leaf pattern is slightly spring like while the white porcelain will showcase the golden color of the ham perfectly! The last thing you need is a good roasting pan like this one. 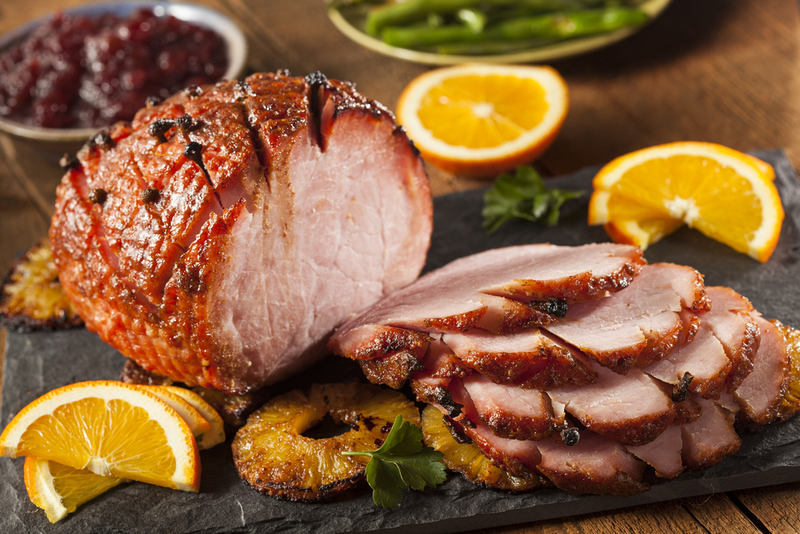 Once you’ve got a good serving platter, it’s time to make your ham. 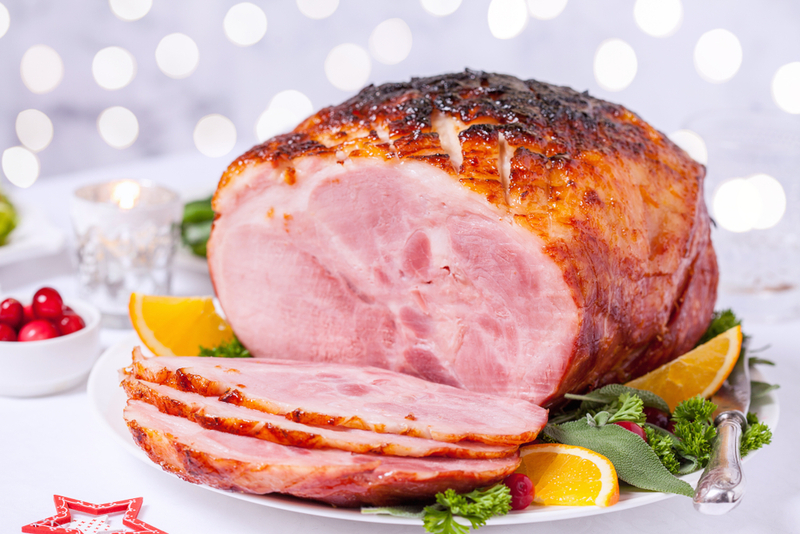 This is a fabulous recipe for a classic glazed ham. Process: Start by warming your oven to 325F. While it’s heating up, score the surface of the ham in a cute diamond patter. Only score about 1/8″ deep. Next, take your cloves and push them into the. middle of each diamond. Put the ham in a large roasting pan with a rack and then create a foil tent for it. This will allow it to heat up without browning. Bake the ham for 2 to 2 1/2 hours or longer depending on the package directions. At about 2 hours of baking, begin making your glaze. Start by heating the brown sugar, mustard, vinegar, and soda in a small saucepan until it’s nice and bubbly. Cook for about 15 minutes stirring constantly until it’s nice and thick. Once it’s done, remove the foil tent (throw this away) and brush the glaze on the ham every 20 minutes until it’s nice and glossy. Remove from the oven and let the ham rest for about 15 minutes before carving and serving. Process: Start by seasoning the ham with the dry rub before wrapping it in plastic wrap and putting it in the fridge to season overnight. Heat your smoker to 250F. While it’s heating up put your ham in an aluminum roasting pan. Place roasting pan on grill and smoke for 3 hours. As the ham is finishing, start making the sweet glaze. Put all the ingredients into a saucepan and simmer over medium heat, stirring constantly until the glaze is syrupy and thick. Pull the ham off the smoker and allow to rest for at least 15 minutes before pouring the warm glaze over the ham. Serve immediately. And there you have it! Two lovely recipes for the perfect Easter Ham. Happy cooking!